Staying within a certain budget is the lot of most brides. So finding discount designer wedding dresses may be essential. The average wedding costs about $25,000, but not everyone can spend nearly that much. A nice wedding can be assembled for much less and can even be put together on a shoestring if necessary. After all, you are not getting married just to have a big party! You are getting married, because you are in love. So if you find that you do need to cut some corners, do not despair. There are lots of ways to save some money and still look stunning. Many wedding planners recommend spending about 6% of your wedding budget on your bridal gown. For the average wedding costs listed above, that would be about $1500. But there are many beautiful dresses for much less. You can find wedding gowns as low as $200 on sale or at discount bridal shops and outlets. Silk gowns generally start at about $2000 and designer gowns can cost $3000 – $7000 or more. You may need to clean the gown if it has been worn before, so keep that in mind if you decide to buy a used gown. And remember, if the gown is polyester, you may be able to hand clean it yourself and save even more. Consider the resources of a bridal shop, They are familiar with various wedding dress designers, fabrics, and have alterations resources readily available. Let them know immediately if you are on a budget so that they can recommend dresses that will work for you in your budget range.They may also be aware of sale dresses that will fit your pocketbook precisely. Maggie Sottero is one very popular designer who specializes in polyester fabrics. Her gowns are well made, with lovely details and range from $500 – $1500 dollars. She also has a less formal line that is under $500. You can also find some websites that sell Maggie Sottero replicas. Call around before you shop, as different bridal shops vary in the price range of dresses that they sell. If you have fallen in love with a gown that is out of your price range, consider having a replica custom made. It is possible that an excellent seamstress could reproduce your favorite gown for a lot less than the designer. Be careful when selecting fabrics though. Many bridal gowns are made of satin. But, be aware that satin is a type of weave, not actually a fabric. There are polyester satins, silk satins and even acetate satins. Stay away from acetate satin. It has a lovely sheen, but wrinkles terribly and loses most of it’s body when cleaned. Do not be penny wise and pound foolish. Invest in excellent bridal polyester or silk fabric if having your gown made for you. And be sure your seamstress is well qualified. Most men rent their tuxedos, so why not consider renting your wedding dress? If you are not determined to save your gown for your posterity, then you can consider renting a wedding gown. However, you may find it difficult to find a shop that rents wedding dresses. Check with your local bridal shop or look online to find a Bridal Shop rental service nearby. If you are unsuccessful finding a gown to rent, consider selling your wedding gown online after your wedding to help offset the costs of the gown now. If this is your plan, use care in your wedding activities to ensure the gown remains in good condition. And look online to determine how much you may be able to get for your gown. Use that number to help you determine how much you can afford to spend. You may find just what you are looking for in a price you can afford. Or you may decide to rearrange your wedding budget to give your gown higher priority so that you can buy the designer gown you love. After all, it is your big day. 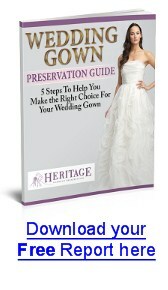 Whatever dress you decide to buy, be sure to include wedding dress cleaning and preservation in your after wedding care. Your dress will be one of the few mementoes of your wedding day that you can keep forever. Would you like to use this article in your ezine or web site? You can as long as you include the copyright notice above a link to our website.